Shaker Cherukuri, MBA/MSEE, is the managing principal at Process Improvement Solutions, Inc and is also a founding member of SynaptIQ+. He has over seventeen years of experience encompassing two continents in various industry segments: discrete manufacturing, power systems/services, energy (power generation), heavy construction/mining equipment and technology. Proven track record for success. Over $350MM economic benefit generated between Cummins, GE, Caterpillar. Over $250MM opportunities identified as a consultant. Shaker's expertise was garnered from having worked at three fortune 500 companies in the United States, two of which are also DJIA components (Cummins, GE, Caterpillar) and one of the top five management consulting firms (Booz). 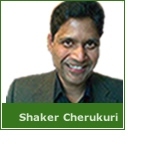 Shaker also worked at two leading technology firms in Bangalore and Mumbai, India (WIPRO and Rolta). Shaker has an MBA in marketing from IU Kelley School of Business and a Masters in Electrical Engineering from University of Louisville. He is also an expert in Lean, DFSS and DMAIC having trained in these Six Sigma Methodologies at Cummins, GE, Caterpillar and Booz Allen Hamilton. Discussing the Eco-System evaluation of Google, Apple, Amazon, Facebook and Microsoft.